Before you try to rescue the kittens, wait to see if the mom cat is around. As flowers bloom and temperatures rise, infant kittens flood shelters while baby squirrels, raccoons and bunnies pour into wildlife rescues. Good Samaritans often bring in these animals, believing they have rescued them. But it’s important to carefully evaluate the situation before deeming a kitten abandoned or orphaned. Infant animals require round-the-clock care and frequent bottle-feeding, resources that some shelters, sadly, do not have. Even when a shelter has the capacity to take care of bottle babies, their chance of survival is best when they are nursed and cared for by their mothers. The best place for a baby animal is almost always with the mother. It’s worth taking the following steps to make sure you’re really helping and not accidentally kidnapping a kitten while Momma Cat is moving her litter. So you’ve happened upon a litter of lonely kittens. First, determine whether they really need help. Are the kittens clean and sleeping soundly? If so, it’s unlikely they’ve been abandoned or alone for long. Momma Cat might have been scared off by you and is watching from a distance or is on a hunting trip. If the kittens are not in imminent danger, try observing them from a distance for a couple hours to see if Momma Cat comes back. If you’re worried about them being cold, place a bottle of very warm water next to them. Contrary to popular belief, most animal parents will not reject their young if they were touched by humans. If Momma Cat comes back and you see her take a kitten and run off with it, she’s moving the litter to a new location kitten by kitten. Try not to interfere. You can come back in a little while to make sure she got all the kittens. Kittens should only be removed from their nest if there is imminent danger or you’ve followed the advice in step 1 and Momma Cat hasn’t shown up after several hours. If you find a single kitten on it’s own, it will likely need to be rescued — but observe it for a little while to make sure Momma Cat isn’t moving the litter and coming back for the last one. Once you remove kittens from their nest, they’ll likely need urgent care. Call your local shelter to see if it can take the kittens in. Some shelters have bottle baby units in the spring or great foster networks with experienced bottle baby caretakers. If not, perhaps the shelter can refer you to someone who can help. If a foster parent is available to take over, keep the kittens warm until you arrive at the shelter. Is the shelter is closed when you find the kittens, you must administer initial care. Depending on their age, kittens cannot produce their own body heat, so they need to be placed on a heating pad, set to low and covered by a towel, and they must be able to crawl off of it. Don’t use chemical flea medications on these kittens or dunk them in water. The best way to clean them initially is by stroking them with a warm, damp towel. 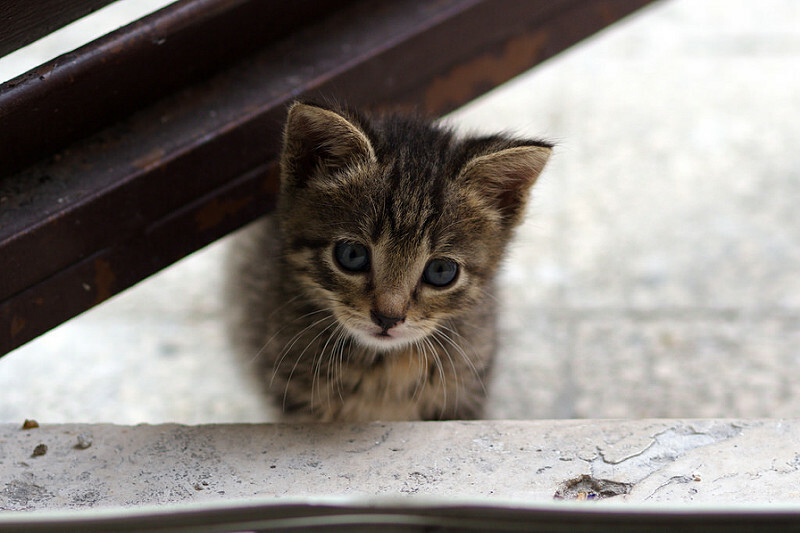 Don’t feed kittens milk — instead, they need to be fed a kitten replacement formula, which you can find in pet stores and most grocery stores, every few hours. Also, for the first several weeks of life, kittens can’t eliminate on their own — you’ll need to stimulate them gently with a cotton ball so they can pass urine or feces. Good news! Momma Cat came back while you were observing the kittens from a distance. If she’s friendly and allows you to approach her, you may be able to rescue her and her litter together. 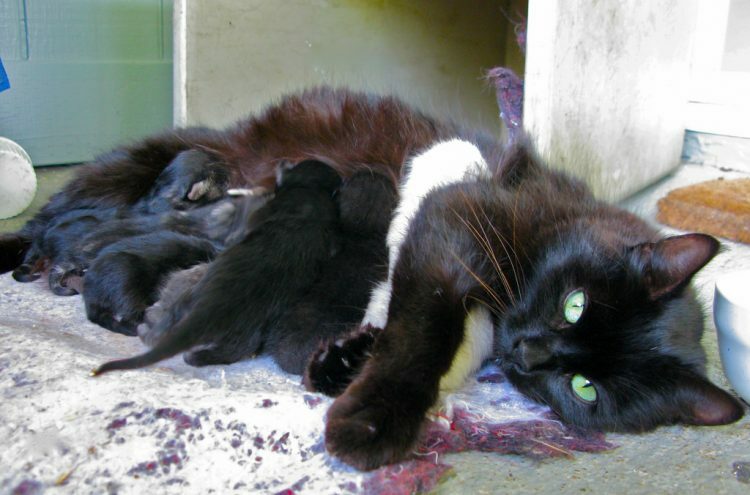 If she runs away from you or seems feral but the kittens seem healthy, don’t interfere. You can still help the family by putting out dry kitten food and water for Momma Cat. As she nurses, she requires more calories than regular cat food provides. By the time the kittens are 6 weeks old, they can eat solid food. At this time, they can potentially be trapped, socialized and spayed or neutered, and then adopted. Once each kitten weighs 2 pounds, the entire family — including Momma Cat — should be spayed or neutered, and then either released or adopted.